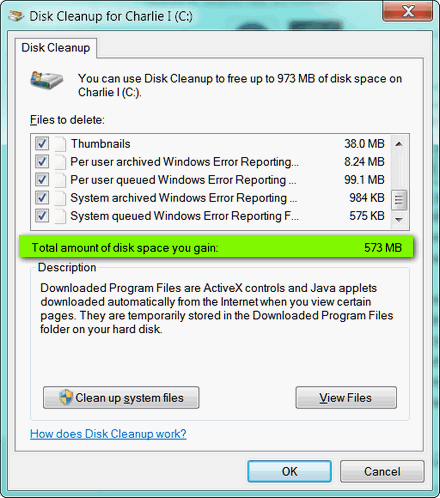 Windows Disk Cleanup is on every Windows XP, Windows Vista and Windows 7 computer. And for those of you who have never used it, you will find it works very, very well. Much better than many of the freeware cleaner programs you’ve probably tried. If you haven’t given Windows Disk Cleanup a try, why not try it right now? To start Windows Disk Cleanup, press the Windows Key plus the “R” key, then type cleanmgr.exe in the command line and press Enter. Windows Disk Cleanup will begin to scan your system looking for junk to remove – well that’s what it does! You’ll then be presented with a dialog that allows you to choose which files you want to delete. The files in this list can be deleted – without worry. 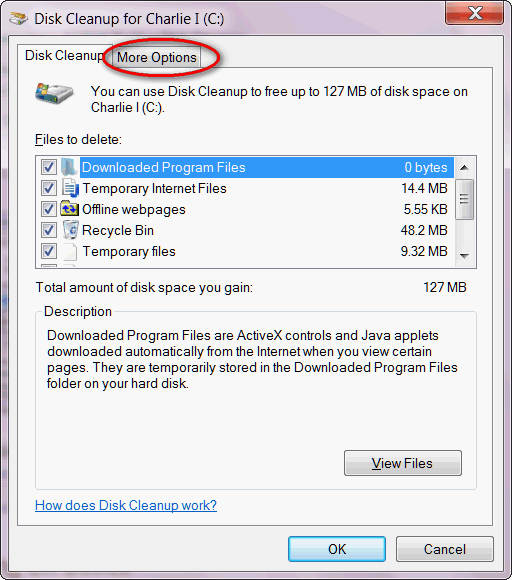 If you want more options, for instance cleaning up old system restore points, click “Clean up System Files”. Another scan dialog will appear and then a dialog – that looks exactly like the first one but with a More Options tab at the top. Click on More Options. You’ll be able to delete all the old system restore files but the most recent one. Do not do this if your computer is running poorly. You may find you need to go back further than the most recent restore point, and if you clean up all the old ones, you won’t have the option to go back further than the most recent restore point. So please use this option with care. I do this about once a month. When I delete the old system restore files I regain about 5-7 GB’s of hard drive space. I think people don’t realize how often a restore point is created when doing a Windows update. Why not just use: Accessories>SystemTools>DiskCealnup? Because, it takes longer than pressing Windows Key/ R, and typing in cleanmgr than it does to burrow though the list in “System Tools”. If you have Windows 7 or Vista you can also type cleanmgr in the bottom of the start menu in the search form and press “Enter” – that’s even shorter. But XP users don’t have that option. Here’s another question; Where’s MY Disk Cleanup Tool? I have an XP but I noticed I don’t have it in the Accessories folder anymore. I can access it using the search tool you taught us how to use, but sometimes I forget what I’m supposed to type in the box to open it. What have I done with my Disk Cleanup tool? I know it USED to be in the Accessories folder.